Helping athletes prevent injury and improve performance. Having been helped by a chiropractor as an athlete in high school, Dr. Rich enjoys being able to now do the same! He also works with athletic adults. “I love working with athletes because they are so in touch with their bodies. They usually know what they need and I’m able to provide it for them,” says Dr. Rich. Our Doctors have helped athletes ranging from a national-level gymnast to golfers. 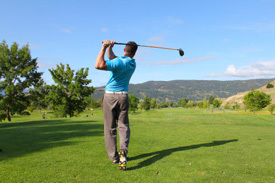 Improve your game, naturally, with chiropractic care! Call us today for an appointment.